Key concept - Systems - What systems can we use to observe and quanitfy what we see in our everyday life, and how can we communicate this information. Related concepts - Form - How can we use scientific models to explain and predict these changes? Global concept - Scientific and Technical Innovation - Matter is fundamental to our industrial and technological development, we need to understand its properties to utilise it to our best advantage. Matter is the 'stuff' that things are made of - it occupies space and we can measure its properties. General or extensive properties of matter depend on the amount of matter that is being measured, and do not allow us to identify or distinguish one substance from another; for example mass or volume.. Characteristic or intensive properties of matter do not depend on the amount of matter and help us identify or distinguish one substance from another (- for example colour, boiling/freezing point or density). We use intensive properties to help distinguish matter. Mass is the quantity of matter in an object. The SI unit of mass is the kilogram (kg), although the gram is often used for smaller quantities and the tonne for larger quantities. Volume is the space an object occupies. The SI unit of volume is the cubic metre (m3). Density is the relation between the mass and the volume of an object. The density of an object is the quotient of its mass per unit of volume. The Si unit of density is kg/m3. (It measures how concentrated the mass is). Melting point is the temperature at which a solid, at standard pressure, completely changes into a liquid, and boiling point is the temperature at which a liquid boils and turns into a gas (or vapour), under standard pressure. The SI unit of temperature is the Kelvin (K), although the Celsius (ºC) temperature scale is often used. What extensive properties of the crown could you measure? Why is 'density' different to these properties? The kinetic particle theory explains the properties of the different states of matter. Everything is made of tiny particles. These particles are not free to move around in a solid, but they move freely in liquids and gases. As they randomly move they collide with each other and bounce off in all directions. These particles can establish forces of attraction between them. Depending on how strong these forces are the state of matter is determined. There are four states of matter: solid, liquid, gas and plasma. We will study the first three. Solids have a fixed shape and a fixed volume. They cannot be compressed and do not flow. Liquids have a definite volume, but not a definite shape, as they take the shape of the container they are in. They flow easily and are not compressible. Gases have no definite volume or shape. They assume the volume and shape of the container they are in. They flow easily and can be compressed. But, how can we explain the different characteristics of solids, liquids and gases? It is the arrangement of the particles and how strong the forces of attraction between them are that makes a difference. Let’s take a closer look! How do substances go from one state to another? It is all about energy! We use heat (= thermal energy) to melt a solid. Heat makes the particles move faster. Once the particles have enough energy, they can start to overcome those forces which hold them together. As we keep providing energy in the form of heat the particles will move faster and eventually the liquid will boil and change into a gas (vapour). 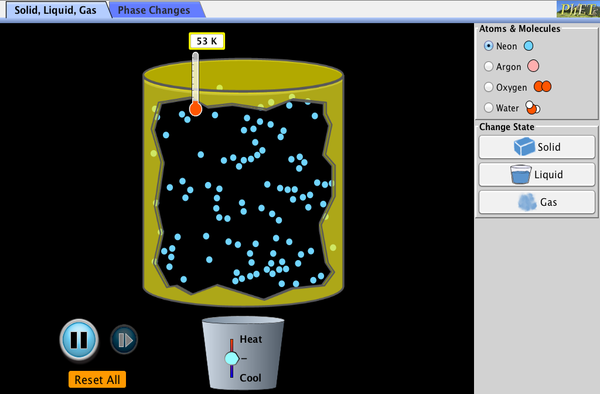 Note that during a phase change the temperature remains constant. This animation shows the molecules of Neon, Argon, Oxygen and Water. What happens to the molecules when you make them warmer? What happens if you keep heating the molecules? What are the three states of matter shown here? How do you make a substance change its state? Add the names of the following processes to this diagram: (You can either draw this in your notebook, or use google docs to complete it. We have seen the three major states of matter, There is a fourth state of matter called a plasma - you might have it in your television. What can you find out about it? What about any other states of matter? An ideal or perfect gas is that which consists of molecules that occupy negligible space, and there is no attraction, nor interaction between its molecules (except at collisions). When dealing with a fixed mass of gas, there are always three factors to consider: pressure, volume and temperature. A change in one of these factors affects at least one of the others. For a fixed mass of gas at constant temperature, the product of the pressure by the volume remains constant. For a fixed mass of gas at constant pressure, the volume is directly proportional to the Kelvin (absolute) temperature. For a fixed mass of gas at constant volume, the pressure is directly proportional to the Kelvin (absolute) temperature. ​The three laws can be summarised as one mathematical equation where none of the variables remain constant. 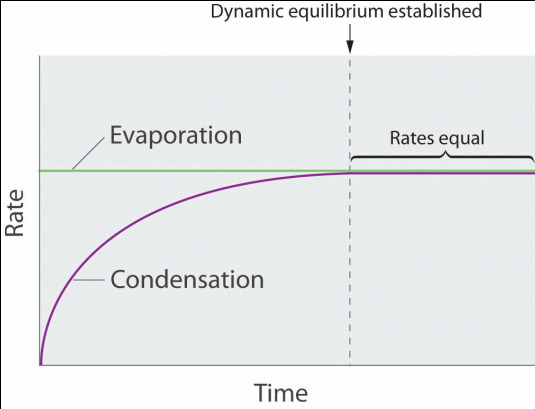 The vapour pressure of a liquid is the pressure exerted by the vapour when equilibrium is reached between its vapour phase and its liquid phase. 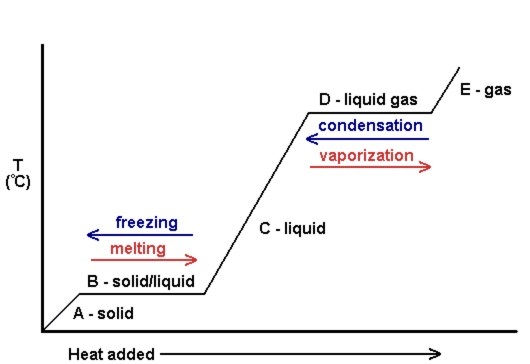 So, at any given temperature, for a particular substance there is a pressure at which the vapour of that substance is in equilibrium with its liquid form (the same number of particles leaving the liquid by evaporation return to the liquid by condensation). This is termed the vapour pressure of that substance at that temperature. ​Well, as not all particles have the same kinetic energy, in all liquids at a given temperature, some particles will move faster than others. The faster ones and near the surface have enough energy to escape and turn into a gas – evaporation – As the number of these gas particles increases, so will the vapour pressure. Eventually a point will be reached where the inverse process will take place; gas particles will lose energy and will turn back into the liquid state – condensation - , reaching an equilibrium, when evaporation rate equals condensation rate. 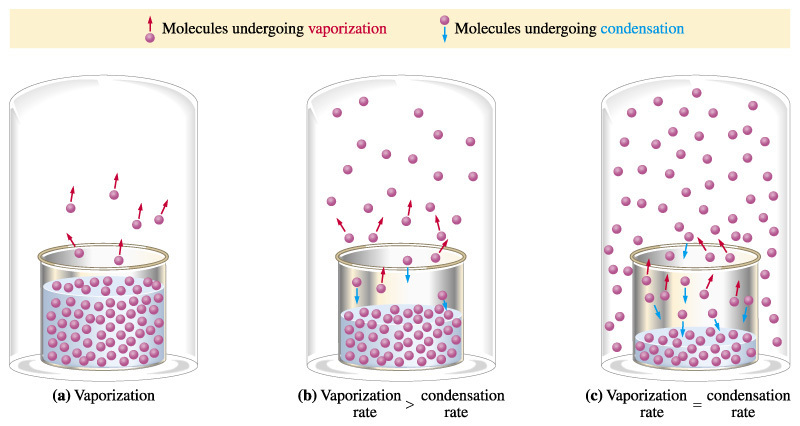 At this point the pressure exerted by the vapour is called the vapour pressure. ​As temperature increases more molecules are able to escape the liquid, and as a consequence vapour pressure increases and vice versa. When the pressure reaches atmospheric pressure the entire liquid will start to boil. We can therefore say that the boiling point of a liquid is that at which its vapour pressure equals atmospheric pressure. Find out what is the cooling effect of evaporation and explain how it applies to sweating. There are several ways of making a liquid evaporate more quickly. ​Briefly explain two of these in your notebook. Gallagher, R. & Ingram, P. (2007). Complete chemistry for IGCSE. Oxford: Oxford University Press. Pople, S. (2007). Complete physics for IGCSE. Oxford: Oxford University Press.